2018 has been pretty good so far for Genesis, Hyundai’s new luxury arm. It launched the 2019 G70 and scored top marks in the 2018 JD Power initial quality test. Now, the results for the APEAL study are out and it looks like Genesis is the top dog once again. The highest possible score is 1,000 points and Genesis, as a brand, ranked the highest. With a score of 884, it beat Porsche by one point. The two were followed by BMW (863), Lincoln (861) and Mercedes-Benz (858). The Lincoln Navigator scored the highest out of any model with 915 points. Basically, it’s a test for how the car makes you feel. Which I feel like is inherently flawed because buying a car is an extremely emotional act in itself. There are 77 attributes, all of which are totaled up on a 1,000-point scale. It’s based on answers collected from November 2017 to February 2018 from almost 68,000 buyers after 90 days of ownership. There’s a caveat to this, though. 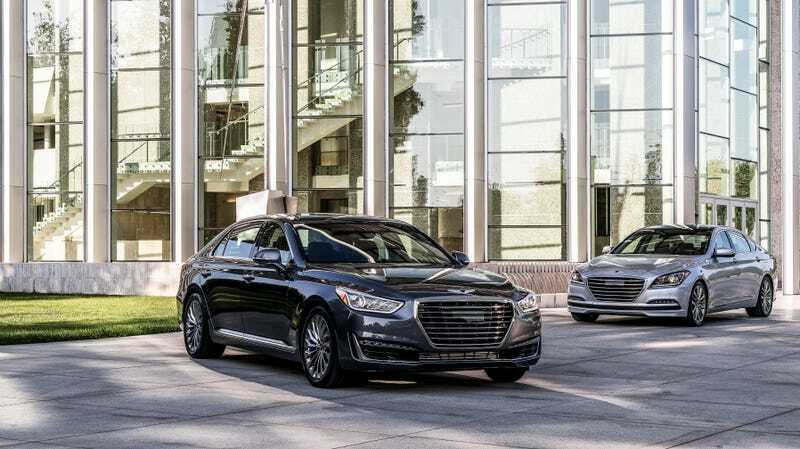 Currently, Genesis only offers two models (deliveries for the G70 haven’t started yet) and during the window of time that the study was being conducted, only the G80 and the G90 were available to buyers. You’re going to have a lot easier time scoring consistently when you only offer two models than when you’re BMW, which offers, like, 89. That’s not saying that the study is wrong, though. When we drove the G80, we liked it very much. I’ve driven the G90 as well, and it’s a fine car. In Genesis’ press release about the study, it didn’t mention which models were evaluated. You can read up about the rest of the study here, but keep in mind that while JD Powers’ results are legitimate, they also work closely with automakers on things like advertisements.